The basic unit of the ERT electric rim thruster is an permanent magnetic synchronous ring motor (PMSM) which is stepless controllable by a frequency converter. The stator is directly fixed to the ships tunnel structure and houses the windings of the electric motor. The magnets are housed in the rotor. Blades are mounted to the inner ring of the rotor, have a fixed pitch and are made from Carbon Fiber Reinforced Plastics (CFRP). The rotor is supported within the stator by a hydrodynamic water-lubricated bearing system. Because of the CFRP blades with high structural damping, less cavitation due to undisturbed inflow (no gearbox and shaft) and no clearance between propeller tip and tunnel hull, our ERT is the most silent thruster you can find. 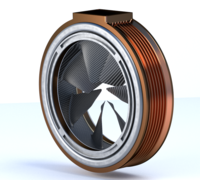 A high torque PMSM motor allows to reverse the thrust from 100% Ps to 100% Stb within seconds. The absence of struts, propeller hub and gearbox within the thruster tunnel causes an undisturbed flow and equal thrust in both directions. 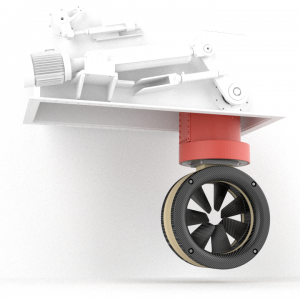 Because of the minimal width of our electric rim thrusters, they can be placed as near as possible to the bow. This enhances the lever between force application point of thruster and the pivot point of the ship. No gears, no dynamic sealings and no oil is needed to operate the ERT. 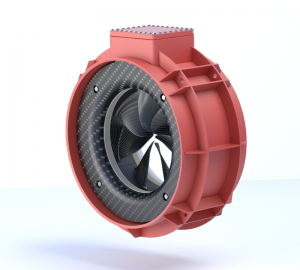 No oils, no gearbox and no propeller hub with struts within thruster tunnel, less installation space to allows better room exploitation and better performing ship lines and a not needed cooling system for the under water thruster unit, all these characteristics creates a smart and efficiency thruster unit. The complete rim thruster unit is placed within the thruster tunnel, outside the ship. Therefore the typical thruster room where the electric motor from a conventional thruster is placed, is not needed anymore. Now the crew cabins for instance, can be placed much closer or even above to the ERT tunnel because of the amazing lower noise and vibration emissions. Our focus is on the development and production of customized Electric Rim Thrusters (ERTs) along with the necessary accessories like swing-out units or azimuthing units. Our ERTs are perfectly applied as bow and stern thruster. They are ideal especially in skeg applications because of the minimum width of the unit. Furthermore, it is possible to save a lot of installation space for other purposes. The typical thruster room where the electric motor of a conventional thruster is placed, is not needed anymore. The crew cabins can be placed much closer or even above the ERT tunnel because of the amazingly low noise and vibration emissions. For new ship designs better performing ship lines are realizable which allow for lower energy consumption and a higher average speed. We offer our ERT technology also for retractable bow and stern thrusters. Customized light weight solutions are realizable with compact dimensions which are perfect especially for sailing yachts. The swing-out mechanism can be driven electrically or hydraulically. As advanced application, we can offer a swing-out fully azimuthing thruster. The ERT is 360° endless turnable. Realized with a hydraulical or electrical steering drive and customized slip rings. Equipped with a permanent monitoring system within the steering unit to detect leakages and to make intended maintenance possible. Integrated into the ships DP system, it is the ideal tool to raise the comfort of your yacht to a nowadays unequaled level. But also as auxiliary drive for motor yachts it is a perfect tool. It can be used there for instance to cruise almost noiseless along the coast, with a speed up to 10kts. The cruising through natural restricted areas is also no longer a problem. Furthermore, the unit can help in dangerous situations, when the main drive fails. It will keep the maneuverability of the ship and can bring you home. If you have any questions regarding our products, technology, services or any other topic, if you want to check applicability for your project or need a quotation, don't hesitate to contact us. Please give us some minimum informations regarding your project by filling out the form below and we will contact you as soon as possible. The fields marked by (*) are mandatory.